Have you always dreamed of having an outdoor wedding or can't imagine not enjoying beautiful weather for your special day? Luckily, there are several outdoor venues in Louisville, Kentucky to celebrate with all of your loved ones! Not only do we love these locations for the abundance of natural light, but being familiar with a venue before the wedding day allows us to get more creative and plan in advance of the celebration for some of the photo locations we'd love to take our couples to. 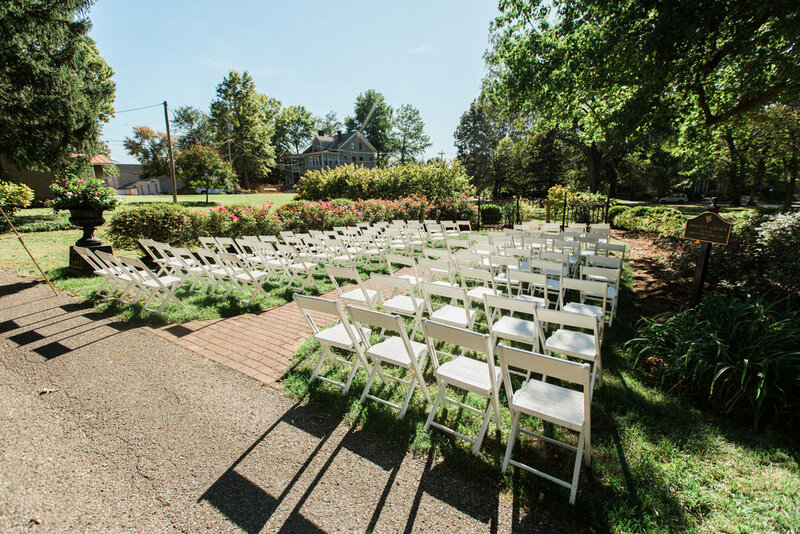 If you're in the early stages of planning an outdoor wedding in Louisville, we highly recommend taking a look at some of the prettiest outdoor wedding venues in Louisville, Ky that we've listed below. A very popular location is the Yew Dell Botanical Gardens . It's a stunning natural setting, with dozens of rare flower gardens and truly unique architecture that's just perfect for organic, boho or romantic styled weddings. The venue even has a castle on site that offers a really beautiful stone background for portraits! If you'd like to see more Yew Dell Wedding Photos, be sure to check out one of our weddings at Yew Dell! 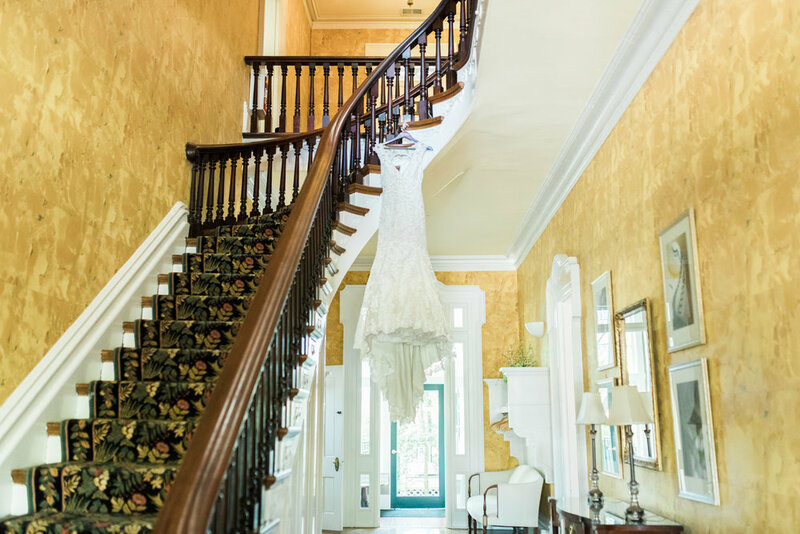 The Oxmoor Estate is a historic plantation in Louisville, as well as a beautiful Louisville wedding venue. With gorgeous gardens, a 16,000 square foot home, and a jaw-dropping grand library, The Oxmoor Estate is definitely one of the most highly revered outdoor wedding venues in Kentucky. If you're searching for an elegant venue with rich history and opulent offerings, look no further than The Oxmoor Estate & Gardens as your wedding venue! The Peterson-Dumesnil House is truly a landmark in Louisville, and a lovely venue for outdoor weddings. There interior rooms are large enough to host your getting ready for both the groomsmen and bridesmaids. 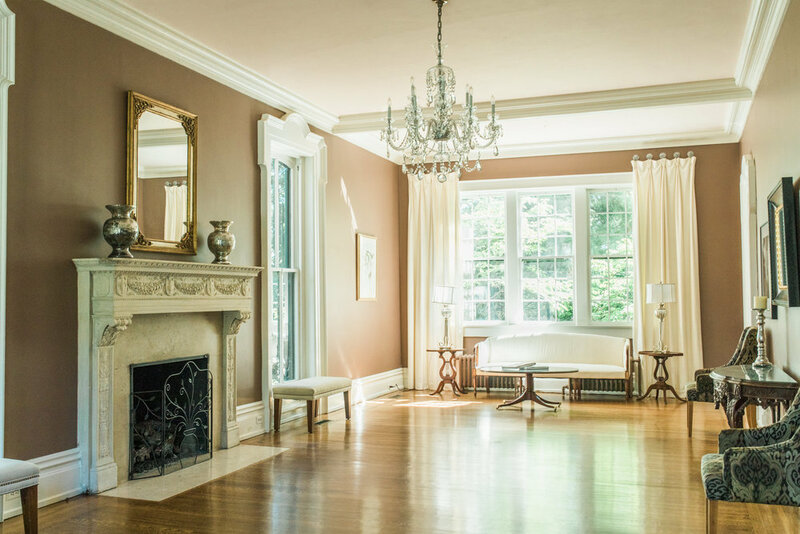 The mansion is filled with eclectic, vintage decor and is spacious enough to host guests as well as your getting ready. If you'd like your reception to be outside, there's a plot designed to host a tent. While the lawn offers a wide space for ceremonies (complete with a brick pathway down the aisle! ), the outside porch is a great option for those wanting a covered area without having to put up a large tent. It definitely brings a warm and inviting vibe for your guests as they arrive! There's something so elegant about a classic mansion with a lot of history, and the Louisville wedding venue Whitehall Estate fits this description perfectly. The gardens at this venue include stunning archways, colorful blooms throughout the year, and stone covered pathways just waiting for your walk down the aisle! About 30 minutes northeast of Louisville is the Hermitage Farm, which is a great space if you're looking to have an outdoor wedding venue with the ability to have some of your guests stay overnight. When you book this location, you also have access to the indoor areas for small gatherings, as well as sweeping views of green rolling pastures on the grounds. This gorgeous location is not only over 100 years old and is listed in the National Register of Historic Places, but Gardencourt is also a stunning wedding venue. With brick-lined pathways through manicured gardens, a fountain in the courtyard, and elegant furnishings inside like the marble fireplaces and a grand staircase, there's lots to love about this venue. One of the best perks of Gardencourt? You have your choice of saying your vows outside in the Rose Gardens or South Lawn, or, if you want an indoor option, you can also book Caldwell Chapel, which is on the same campus. One of our favorites is the 21C Museum Hotel for a variety of reasons. If you're looking to make your wedding easy and relaxed, you can have your getting location, ceremony, and reception all in one place! It houses a private rooftop penthouse and open/outdoor rooftop overlook with beautiful views of Louisville and the Ohio River! Between exposed brick walls, unique architecture and an outdoor rooftop area, it's a venue that's hard to beat. 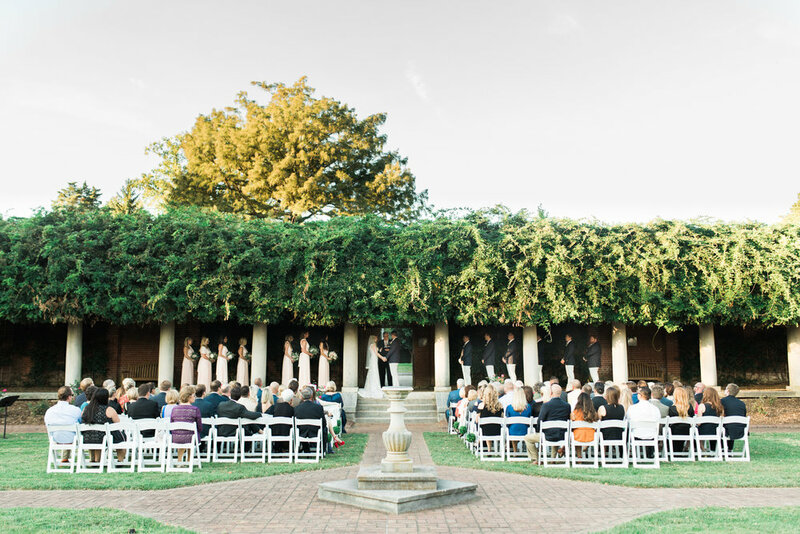 NOAH's Event Venue in Louisville offers an uncovered outdoor ceremony area with a large indoor hall for receptions. The outdoor space is enclosed with a red brick wall for privacy, but trees surrounding the property still give an organic feel to balance out the more modern style of this venue. This location also has a beautiful pergola that you can use to decorate for your ceremony backdrop as well! Another elegant option for an outdoor ceremony location with an indoor backup option is the historic Olmsted. You can say your vows outside on the lawn underneath some of the tall oak trees, and celebrate with your closest friends and family in a dining hall that still has lots of natural light (and some gorgeous chandeliers!). If you'd like to see more The Olmsted Wedding Photos, be sure to check out a blog post of one of our weddings at The Olmsted! And last (but definitely not least!) is the Ice House, which is the perfect space for indoor/outdoor weddings of almost any size! You can have your ceremony outdoor on the East Terrace and easily allow your guests to head straight into Main Hall for an indoor reception. Or you can use their Rooftop Garden, with a truly unique "green space" that has a view of Downtown Louisville! Did we miss a venue that you think would fit well on this list? Let us know in the comments! Talk with a Husband Wife Wedding Photographer Team in Louisville Ky! Once you've selected a date and venue, you should start looking for the right wedding photographer (or photographers!) for you. We’re Jeff and Michele, a husband and wife wedding photographer team based in Louisville, Kentucky. Your engagement and wedding photography experience is our top priority — we want you to cherish it forever!